In the third year of the John G. Thorpe Young Professionals and Students Fellowship, the Conservancy welcomed four honorees to the October conference in Madison: Rebecca Hagen, Registrar, Fallingwater (Masters in Museum Studies, Johns Hopkins University, 2013); Kristi Jamrisko Gross, Museum Guide, Pope-Leighey House, (M.A. in Art History and Archaeology, University of Maryland, College Park, 2015); Allison Semrad, Robert Silman Fellow for Preservation Engineering at National Trust for Historic Preservation (MS in Historic Preservation, Columbia University 2017); and Ashley Williams, Graduate Student (M.A., History of Art and Architecture: University of Massachusetts, Amherst, 2018). We asked each for their reflections on their first Conservancy conference. It was amazing to visit so many Wright-designed buildings and affiliated sites over a four-day period, and I was amazed at the wealth of knowledge held by the conference attendees, in explaining the chronology and specifics of Wright’s work (and affiliates’ work), in describing and experiencing architectural space, and in fixing and maintaining buildings. As a young engineer, I only often see a very particular slice of building projects, so I appreciated this breath of fresh air in touring many beautiful spaces; as a reminder of the less-tangible ways that buildings and design are important to our outlook on the world. Surely the best way to experience Wright’s work is to walk through the buildings themselves, and this conference far exceeded expectations in providing access to sites. From a more practical perspective, I am appreciative for the opportunity to have met many people with an interest in architecture and construction. I loved hearing details about building projects, including overall stabilization projects, exterior restoration work, plans for adaptive reuse, and the conservation of important decorative elements. I believe there is a lot of value in having a practitioner explain their process; why the work was required, what were the challenges, what the required expertise was, and ultimately what was the best solution for making a building safe, aesthetically correct or livable again. The conferences’ morning lectures provided many deeper dives into building projects, and gave credit to the many hands and minds that have worked to maintain and protect Wright building, including architectural advocates, preservationists and especially craftspeople. Looking back at the conference, I gained a better understanding of what constitutes being a good steward of a Wright-space—exactly what it takes as a homeowner, builder, architect (or even engineer!) to take care of Wright buildings in a way that does them justice as functional and architecturally-wonderful spaces. The Frank Lloyd Wright Building Conservancy conference was an incredible experience. The passion the Frank Lloyd Wright community possesses is absolutely contagious. Conference attendees were eager to share their knowledge (and in many cases their homes) and were very welcoming to newcomers. Time spent with other participants led to captivating conversations and discovery. As an emerging professional in the Wright world and as my first trip to Madison, Wisconsin, it was invaluable to my understanding of Wright’s designs to visit Taliesin; his place of origin and inspiration. Not only did we get to explore Taliesin, we got to visit several additional Wright-designed buildings during the conference. I find that the ability to physically engage with a Wright design is critical to my perception and appreciation of his work. The morning sessions were also incredibly informative. It was wonderful to hear updates and outcomes from some of the largest architectural preservation projects being undertaken on Wright’s designs. I particularly enjoyed Ken Dahlin’s thoughts on the similarity in the layering of planes to create depth in both Japanese woodblock prints and in Wright’s projects. As someone with an educational and professional background in collections, I found this to be a fascinating approach to thinking about Wright’s influence and creative process. I am grateful for being awarded this opportunity to visit so many new Frank Lloyd Wright sites as well as to engage with so many wonderful people. Thank you to the Frank Lloyd Wright Building Conservancy and the Thorpe family for this experience. I would like to thank the Frank Lloyd Wright Conservancy and the John G. Thorpe fund for their generosity in supporting such an incredible opportunity for young scholars. My five days in Madison were a whirlwind of incredible experiences which I will never forget. As someone who has studied Wright, but had been to few Wright sites, the conference was a phenomenal exposure to his built spaces. Hearing from people involved in the preservation, care, and study of these spaces was even more special. For example, getting to hear about the process of restoring Jacobs 1 from James Dennis, and then visiting his home the same day was marvelous. The fire was crackling in the fireplace, and the flickering light and smell of wood-smoke activated the space’s extraordinarily human-scale, cozy interior—I think we never wanted to leave! Visiting Taliesin showed me another side of Wright–his own personal home and the school he ran, which continues today as a major part of his legacy. Seeing Wright’s spaces in person will no doubt have an impact upon my own scholarly work as I think about future research. Aside from visiting the incredible spaces and places that we had the opportunity to explore, the conference was also a huge opportunity to meet others in the field. As a young professional, it was extremely helpful to meet other young professionals as well as the scholars and preservationists present. It opened my eyes to the presence of an entire Wright community, which I am now happy to be a part of. Finally, it was wonderful to hear from attendees about what an incredible person Mr. Thorpe was—without this generosity none of this would have been possible, and I am extremely grateful for the experience. I am truly grateful to have received a John G. Thorpe Fellowship to attend the Frank Lloyd Wright Building Conservancy conference in Madison. What has lingered most is the human aspect of architecture and preservation, which was so clearly demonstrated by the conference speakers, guides, staff, and participants, and which reverberated in the dozen Wright buildings we visited. The sessions opened with Sidney K. Robinson’s prologue to our tour of Jacobs I and some larger points about Wright’s architectural philosophy—for example, that he sought to build upon rather than destroy the past. I found Ken Dahlin’s presentation on Japanese prints not only insightful—particularly his invocation of miegakure in relation to Wright’s spaces—but relevant to a “Wright and Japan” tour I developed for Pope-Leighey House. Keiran Murphy’s archival dive into Taliesin demonstrated the joy in making new discoveries about a well-studied subject. Tim Quigley added to our Taliesin briefing with his exploration of the lives of the early Taliesin fellows, vivifying the clean lines and quiet hills with stories of picnics and cooking and cleaning. The “Preserving Taliesin” panel was a fitting prelude to our afternoon journey to Spring Green, and the speakers revealed the variety of people who have a stake in Wright’s works. I was inspired by the oral history program that Jack Holzhueter discussed, the way that a place is energized by personal reflections. As he noted near the end of his talk, “Preservation may have saved the studio but it doesn’t capture the soul of a building the way the story of a life does.” I was also captivated by a quote from Ryan Hewson, who stated that Wright does not represent “either/or” but “both/and;” the architect’s ability to make connections echoed throughout the conference. With my art history background, I have not spent much time considering the maintenance of Wright buildings. During the Homeowners and Public Sites dinner, Marty Peck and Fred Prozillo presented on lighting and energy efficiency, two critical topics that I hope to discuss with my PLH colleagues soon. Similarly, it was a delight to hear from Gary Zimmer and Mike Degen, and to see the roles agriculture and the landscape have played in Wright’s own life and in the continued life of Taliesin. Zimmer and Degen reflected the “both/and;” their talks underlined Wright’s interdisciplinary approach and the connections he drew between later projects and his roots in the Wisconsin countryside (“No house should be on a hill or on anything. It should be of the hill…”). The conference presented a full picture of the state of Wright in 2018: historical past, current projects, and future challenges. In “Advocating for Wright Buildings,” Barbara Gordon related the tragic loss of the Lockridge Medical Clinic and the threats facing the David and Gladys Wright House in Phoenix. Her presentation was a jolting reminder that not everyone is preservation-minded, and that Wright’s legacy will not be preserved by default. The “Preserving in Action” panel offered three success stories: Charles J. Quagliana’s delineation of restoration efforts at the Unitarian Meeting House; Mary Roberts’s exquisite look at how the Martin House’s wisteria fireplace was brought back to life; and Gunny Harboe’s virtual tour of the restored interior surfaces of Unity Temple. The obvious dedication and craftsmanship revealed how much Wright’s places continue to depend on people. 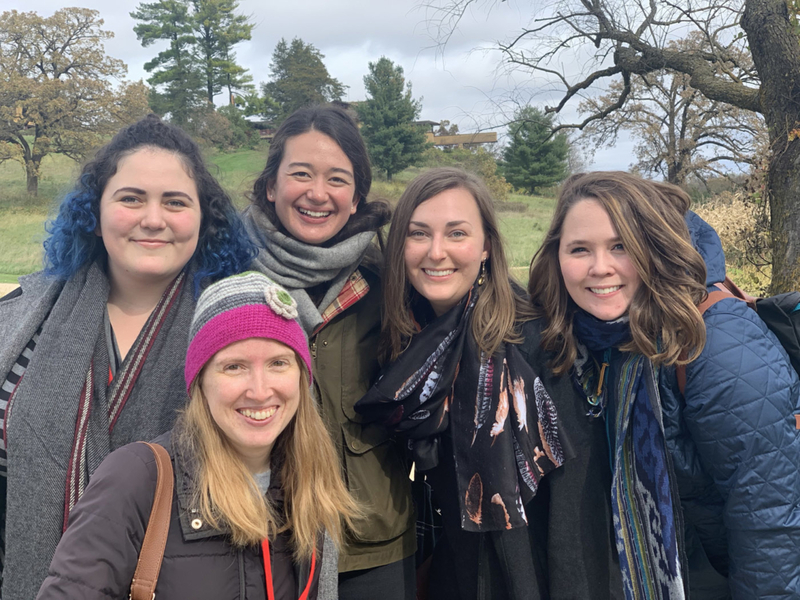 Anna Andrzejewski skillfully evoked this connection between people and places in her recap of an undergraduate seminar on Wright’s work, which gave me some ideas about how to better engage with young visitors to Pope-Leighey. Nowhere was this human element more explicit than in the field trips and homeowners’ talks. James Dennis’s lecture was a useful prologue for “my” Usonian house, which was built four years after Jacobs I. But the moving aspect of the talk was the breathtaking transformation of a neglected structure into a home more than deserving of its legacy as the Ur-Usonian. To visit Jacobs I that afternoon was an unforgettable experience: a crackling fire mixing with the aromas of wood and spices, and the patient Dr. Dennis standing in his kitchen nook, fielding our many questions. This was my first time in a lived-in Wright house, and it was a striking reminder that the Pope-Leighey House also started out as a home. I have been thinking about why guests so readily connect to Pope-Leighey, and realized it is for the same reason I will always remember the cozy Jacobs I: it feels like home. These human touches are what I will treasure from my experience as a John G. Thorpe fellow. The congenial Stewart Macaulay holding court in his perfectly mid-century living room, filling the open space with the anecdotes about his home. A Sigma Phi brother offering a docent-worthy glimpse of the Bradley House. The delightful couple that owns Rudin House, all smiles as they welcomed its first tourists in a half-century. Our Unitarian Meeting House guide explaining how the church’s design facilitates worship. The Taliesin apprentices bubble-wrapping their design projects in preparation for their migration to Taliesin West. And my conversations with other fellows and attendees, which gave me a deeper appreciation of why Wright matters to so many people. My experience as a John G. Thorpe Fellow helped me realize that the human side of Frank Lloyd Wright’s buildings may be our greatest tool for fostering appreciation of his work among new audiences, and for ensuring the continued preservation of Wright’s legacy. Two Wright public site directors, Vivien Lasken of Fabyan Villa and Marta Wojcik of Westcott House, also attended the conference on scholarships from the Keepers Preservation Education Fund. Donations to the Thorpe Fellowship, which provides for complimentary conference registration for graduate students or architecture/preservation professionals in the first five years of their career, are accepted year-round on the Donate page. Donate to the Thorpe Fellowship fund today!